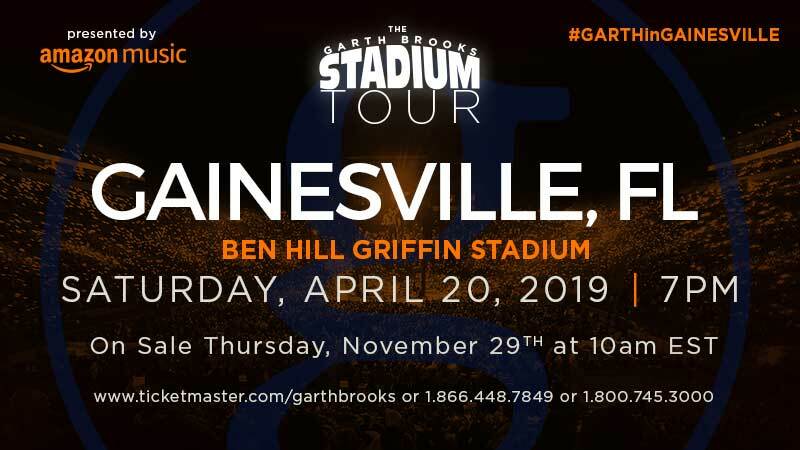 LOS ANGELES- November 20th, 2018- The Garth Brooks Stadium Tour is coming to Gainesville, FL. The concert will be Saturday, April 20th, 7:00 PM at University of Florida's Ben Hill Griffin Stadium. It's the first Ben Hill Griffin Stadium Concert in 25 years. The tour is presented by Amazon Music. Gainesville, FL will be in-the-round staging. Tickets will be on sale Thursday, November 29th at 10:00 AM EST. There will be an eight ticket limit per purchase. Tickets can only be purchased at ticketmaster.com/garthbrooks or either Ticketmaster Express 1-866-448-7849 or 1-800-745-3000. Please note there will be no ticket sales at the venue box office or Ticketmaster outlets on November 29th. Tickets will cost $82.35 plus a service charge of $7.25 and a $5.35 tax for a total of $94.95. All seats sold are best available.